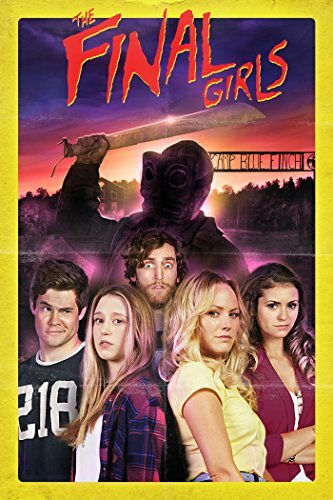 Alright so, for today’s Revisit, I thought I would look back on the first time I saw a movie that I now LOVE: The Final Girls (Todd Strauss-Schulson, 2015). I figured when I went back to watch my original review, that I would have had more dislikes, but that is so not the case. In fact, my only dislike originally was that the nerdy horror movie obsessed character, Duncan (Thomas Middleditch) isn’t in the film more. Originally, I found the movie to be so clever in its delivery of slasher movie tropes and conventions by taking it a step further than Scream (Wes Craven, 1996). In Scream, the characters are aware of all the horror movies that the audience is, and they know the cliché and quote the lines. In The Final Girls, they take it further by having characters that know about horror movies and then putting them in one. So, the characters are aware of the slasher clichés and they are aware that they are in an actual movie…within the movie…you know what I mean. I have now seen The Final Girls many times, and each time I love the movie more and more. I find something else to love about it with every watch. This time around, I found myself really connecting with the mother-daughter story, not because my mom is gone or anything, but I am close with her. The Final Girls is a meta-slasher that has a storyline other than just parodying the slasher paradigm which is just damn good writing. You could watch the film just on its own, not considering the influence of 80s slasher films, and the movie still stands up all on its own. At it’s core, The Final Girls is a film about a grieving girl who just really misses her mom. I’ll be honest, I cried this time around at the end, when Max (Taissa Farmiga) must really let her mom (well, the movie version of her mom) go; it’s such a touching moment. I also really love the cutesy romance between Max and Chris (Alexander Ludwig), especially how the film isn’t just about the romance. More and more I’ve been getting tired of romance in movies where it isn’t necessarily needed. I could write a whole post about it, but in short, sometimes I feel like if there is a single man and a single woman in a film, it’s understood that there will be a romance between them. Whether it’s a horror movie, action, comedy, whatever; and sometimes the romance just feels forced, not a part of the story. Now, in the case of The Final Girls, the high school crush action between Max and Chris is part of the movie, and it’s not shoved into every nook and cranny of the film (if that makes sense). Also, you have to love how Max goes off, saves her mom and takes down the killer all on her own, so kudos for that!